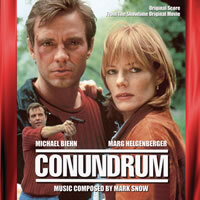 BUYSOUNDTRAX Records presents CONUNDRUM aka FRAME BY FRAME, featuring music composed by Mark Snow for the 1996 thriller written and directed by Douglas Barr (THE FALL GUY, THE WIZARD), starring Marg Helgenberger (C.S.I., CHINA BEACH) and Michael Biehn (THE TERMINATOR, ALIENS, TOMBSTONE) . Released in 1996, CONUNDRUM aired on the Showtime cable network and tells the story of Stash and Rose, two Minneapolis police officers trying to break a gambling racket in the local Vietnamese community. While the two partners are working the case, they are involved in a shootout. One of the victims in the shootout turns out to be the son of the local gang boss. In reprisal, Stash’s pregnant wife is killed in their own home. When the gang member who is suspected of the murder turns up dead, Stash himself becomes a suspect and his only alibi is his partner, who he has become personally involved with, which puts Rose in a very precarious situation. To score CONUNDRUM, director Douglas Barr turned to Mark Snow. They had worked together previously on another thriller, DEAD BADGE, and would go on to collaborate on a total of four projects. At this time, Mark was already involved scoring THE X-FILES and was preparing to begin work on MILLENNIUM. In many ways, Snow’s music for CONUNDRUM anticipates the kind of writing style he would use on MILLENNIUM, primarily dark textures contrasted with poignant and evocative melodies. For CONUNDRUM, Mark Snow composed a score that emphasizes piano, voice, percussion and sampled orchestra to achieve a rich sound structure that significantly enhances the film. The score is comprised of three essential elements. A compelling love theme for piano, a haunting melody augmented by female voice for Rose and a layered series of synth tonalities punctuated by percussion to heighten the suspense and mystery of the film. Mark Snow is primarily known for his work in the medium of television, including many seasons of music scoring for shows such as THE X-FILES, MILLENNIUM, SMALLVILLE, GHOST WHISPERER, NOWHERE MAN and many others. Mark is considered one of television’s most capable composers. The large percentage of his musical output has centered around the subjects of the supernatural, the macabre and outright science fiction or dark fantasy but there have been occasions for him to break out and work on other projects, such as the 2006 romantic drama, PRIVATE FEARS IN PUBLIC PLACES, for Alain Resnais, the great French director. Mark Snow has worked on more than a hundred television movies and series, PC games and feature films including THE X-FILES, MILLENNIUM, SMALLVILLE, GHOST WHISPERER, NOWHERE MAN and the recent THE X-FILES: I WANT TO BELIEVE feature film. Mark has been nominated for 14 Primetime Emmy awards since 1984 and won at least 19 ASCAP awards. The composer is also a founding member of the legendary New York Rock'n'Roll ensemble, along with fellow composer Michael Kamen. The band was signed to Atlantic Records and Mark toured and recorded with them for 5 years before turning his focus to writing music for film and television. BUYSOUNDTRAX Records presents the original motion picture soundtrack to CONUNDRUM, featuring music composed by Mark Snow. CONUNDRUM is a limited edition release of 1000 units. The first 100 copies ordered through the website will include a booklet signed by composer Mark Snow.